Forty members and guests attended the June 2018 Kansas City Chapter meeting. The Kansas City TCC chapter met for lunch on Friday, June 26, with 40 members and guests. Phil Larson gave an excellent program, on his photographic journey to all seven continents. Charles Merkel, from St. Louis, surprised everyone by presenting our chapter with a beautiful four-foot banner he created and paid for featuring the Kansas City skyline. The trivia question asked which single country was responsible for 30 percent of the world’s lava flow since 1500. Guest Charles Batte, correctly named Iceland. Future meetings will be held on Sept. 28, and Dec. 7 at Trezo Mare Restaurant. 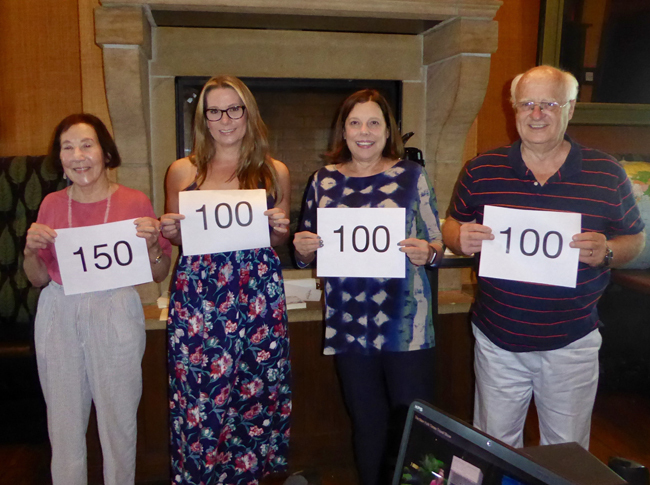 At the June meeting, four members were recognized for achieving TCC goals: Dr. Arlene Segal for visiting her 150th country and from left, Starr Gehrke, Bonnie Burns and Nelson Allen for visiting their 100 country, and achieving full membership in the TCC.